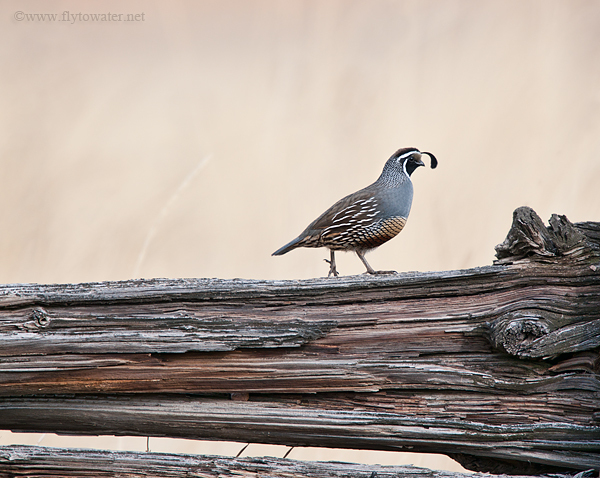 No religious extremist has ever been as fanatical about a concept as quail are over the posting of sentries. In covey society, forgetting to have someone stand guard is like wearing an argyle sweater vest - it's the unthinkable. Spanish Inquisitors took Christianity far less seriously, and appear slapdash in comparison to the diligence of these feathered lookouts. 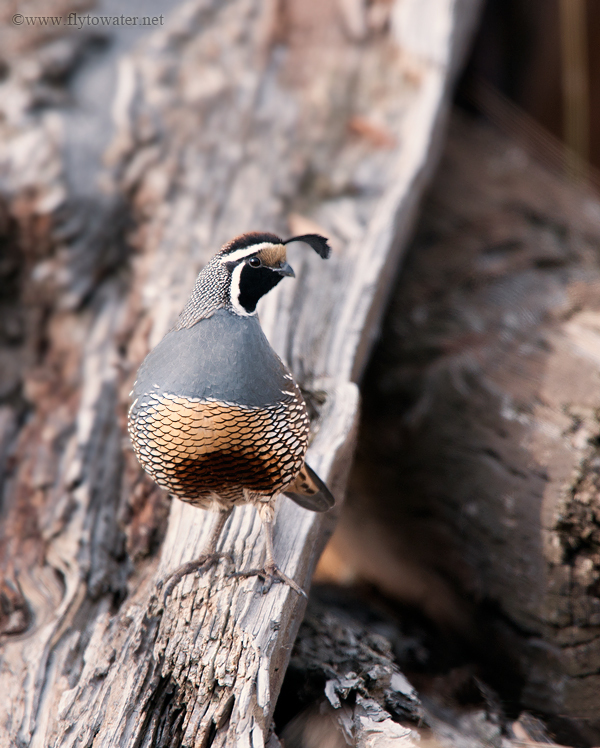 Where I live, quail are somewhat of a dichotomy because they adapt well to urban settings. In residential areas birds are semi-tame as they move from feeder to feeder, pausing only to avoid the occasional obese house cat crossing their path. As subjects of photography, these city dwellers are far from ideal. Photos of game birds perched on a Prius or crossing a well-manicured lawn don't represent the proper wild, upland heritage. Unfortunately for me, quail living in a rural setting are more paranoid than a methamphetamine addict that's just downed a double espresso and Red Bull frappé. Constantly contending with numerous raptors, coyotes, bobcats, skunks, racoons, snakes, and other predators - the wild variety invariably appear to be on the verge of a psychotic break. Upon seeing a hominid in the distant atmospheric shimmer, a rural quail's eyes will protrude slightly out of the head and cause a jolt of adrenaline to surge to the wings. Any attempt to approach to within 100 yards will result in the wholesale evacuation of the premises. Last year I scouted a really nice farm that had both a healthy quail covey and some classic upland habitat including some fences made of nicely weathered wood. My hope was to get a few shots of these birds in an iconic setting, but despite making 4 separate attempts, the covey never let me get closer than a football field. Even with a long lens, my operating distance on a subject this size is about 25 feet. I wasn't even in the ballpark. Except one. The sentry male had taken up the rear guard position, perched on a section of broken fence. In a fleeting moment of opportunity I made a digital copy of him from about 25 feet away. I was glad to finally glimpse this this well-dressed gentleman through the viewfinder. Your writing style is unmatched by only the quality of your photos. Man that bird looks pristine - I also like the detail in the grain of the wood, and the lighting is perfect. Those are some interesting photos, nice job Thresher! All those years training with monks and mastering the art of the ninja has paid off. Ninja vanish! Thanks Jason! This is one of those bucket list type shots and I was pretty happy to finally get this guy on the sensor. Amazing work as always Bret. Thanks for sharing. BC sweet work. I would enjoy the opportunity to tag along some day. I think it would be fun to stalk sans Binelli or Beretta. Be cool and have fun.